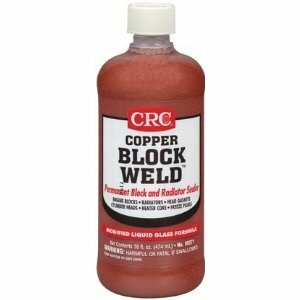 CRC Copper Block Weld Permanent Block & Radiator Sealer 16oz. This modified liquid glass formula formulated with copper permanently seals cracks and holes in aluminum and iron engine blocks and cylinder heads, all metal and plastic radiators, head gaskets, water pumps, and freeze plugs. This Bottle is meant for treating systems OVER 6 Gallons. CRC Industries is a worldwide leader in the production of specialty chemicals for the maintenance and repair professional, serving automotive, marine, electrical, industrial, and aviation markets. CRC Industries has been ISO 9001 certified since November 19, 1996 and adhere to strict guidelines in all facets of their research, development, and production. CRC's leadership in the maintenance chemical markets is reflected most positively in our product development. CRC continues to introduce innovative new products to meet the needs of our customers.